Another Summer vacation is behind us. Each year we make a trek to St. Augustine, Florida so Mrs. Nashveggie can veg-out on the beach. It’s her one annual requirement. Sand, the sound of waves and a book pacifies her. St. Augustine is the city she went to college in and where she lived when we first began dating so returning there is based on the fact we know the area quite well. That and the fact there’s a beach. The beach is important if I didn’t emphasize that enough already. We like the fact the beaches aren’t overrun with nutty families with coolers in tow and it is highly preferred over the Redneck Riviera which so many from this area attack every year. You know where I’m talking about, that strip of beach that runs from Mobile, Alabama to an area just east of Panama City Beach, Florida and where you’ll find every beer-gut, Budweiser-swilling, SUV-driving, camouflage-bikini wearing redneck in a 500 mile radius. Yes, the Redneck Riviera, not what this post is about nor where you’ll find me. As I said, we head to St. Augustine on the East coast of Florida where the beaches are clean and relatively free of crowds if you know where to look. We have our own little beach few know about or at least few choose to go there and that makes us all the happier. 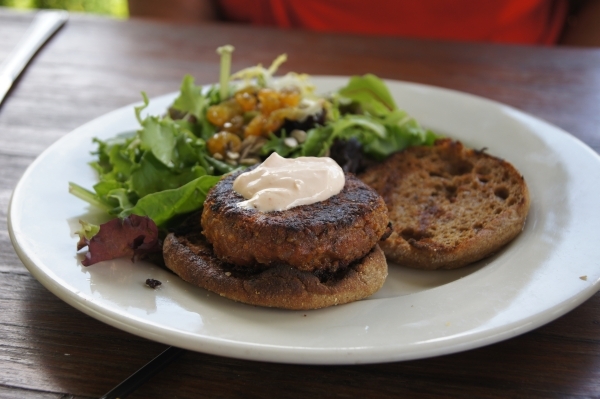 St. Augustine has a few places to find a vegan lunch. I’ve written on them before and the choices have not changed. If you’re looking for a big vegan dinner you’re best moving up the road to Jacksonville or south to Daytona as the choices aren’t the widest in St. Augustine. You could try The Perfect Moment, a raw vegan cafe serving what I lovingly refer to as “pretty food” but I can give you no pointers on that as it is “pretty food” and I don’t typically partake of that. 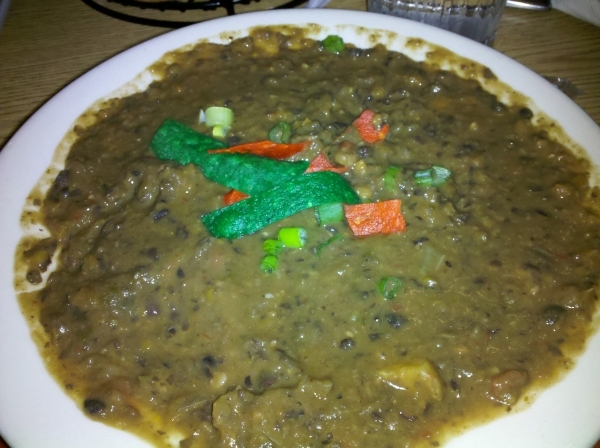 You could go to The Manatee Cafe, a great vegetarian restaurant that serves mostly things I make easily at home. The do have great vegan breakfasts and sandwiches but we didn’t visit this trip. We did visit Stir It Up, a small walk-up lunch counter serving wraps and smoothies as well as Mango Mango’s where it’s not easy to order vegan off the menu and if you ask for what can be made vegan you’ll still have a slim selection. Mango Mango’s does, however, have a killer Black Bean Soup. I know, soup isn’t exactly what you might want for dinner on a hot, humid beach vacation but it really was exactly what I wanted. The black bean soup was heavy on the jerk seasoning and contained small chunks of one of my favorite fruits, plantain. 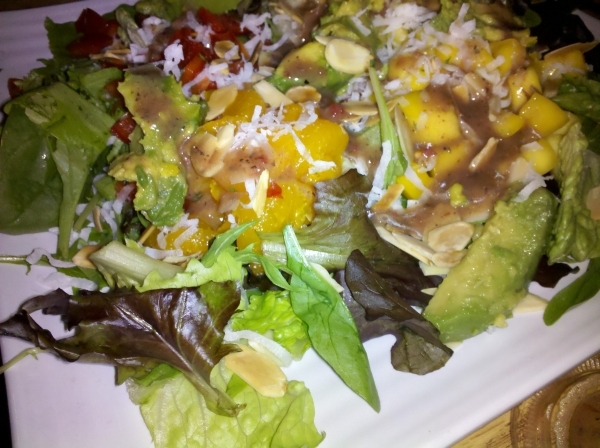 Mrs. Nashveggie had the Caribbean Mango Island Salad, a mix of greens topped with peppers, oranges, coconut, almonds and mango. The salad looked great and tasted fresh. Heavy on the mango and sweetness. We ate at Mango Mango’s a couple times and had the same each. We also made a few trip to The Spanish Bakery. Cheap lunch awaits! Two fresh bowls of gazpacho, a big hot loaf of bread, six cookies and drinks for $10! Seating is all outside under big shade trees and on a hot day gazpacho is perfect. Most of our time in St. Augustine was spent on the beach as it usually is and meals were relegated to fresh fruit and peanut butter & jelly sandwiches. On the drive back we stopped off in Atlanta for a couple of days. My mother-in-law lives there so life wouldn’t be pleasant if we passed through without stopping for a visit. We decided on a new place for lunch, Urban Pl8. I had read good and bad about it but the food always came out good in reviews. Our arrival was during brunch on Sunday about noon. A 40 minute wait and we were seated outside near the small garden where some of the ingredients in this “local food” restaurant are sourced. Looking over the menu and reading between the various Paleo selections and after asking which selections could be veganized I decided on the Vegan Breakfast Plate. It included a pinto bean cake that was just a bit spicy but lacked much else on seasoning or salt leaving it very bland. It was accompanied by braised kale that was very good and maple sweet potatoes which I could have eaten a second serving of. Overall, not a bad meal but something should be done about that pinto bean cake. Dress it up in some flavor-love. Mr’s Nashveggie had the same and my mother-in-law had Lily’s Nut Burger, a patty of walnuts, cashews, brown rice and cheddar cheese topped with sour cream on a whole wheat English muffin. Of course, it’s not vegan but is vegetarian so add that a choice if that’s your way. It was on the small side and I would have needed at least 4 of them to consider it lunch. It was served with a mixed greens salad that was drenched in a very spicy dressing. Again, on the small side but I guess hangovers need small eats for brunch. The Kid had tofu scramble and the same maple sweet potatoes included with the vegan breakfast. The scramble looked very good and had subtle flavor. It contained a mix of red peppers, zucchini and onions and seemed to be cooked in an abundant amount of oil which was served along with in the bottom of the bowl. The food was nothing outstanding and I’ve had worse but the service was really bad. It took 10 minutes to get our drinks after ordering and 20 minutes for a refill of my sweet tea. The Kid’s tofu scramble was served with shredded cheese on top, which was not even mentioned in the description, and was replaced with a fresh dish when we brought it to the server’s attention. I’m not sure on the exact breakdown on the time but we arrived at the restaurant at noon and left after eating, no floundering after finishing, at 3:20. Most of this time was spent waiting for our meals. Everything seems to be prepared fresh when ordered and to order by one cook. The restaurant wasn’t extremely packed. If you do plan on visiting Urban Pl8 be sure to give a good amount of time to get in and out. Dinner that evening was on the mother in law’s suggestion. She had decided we should go to Nicola’s. No argument from me, Nicola’s is great. 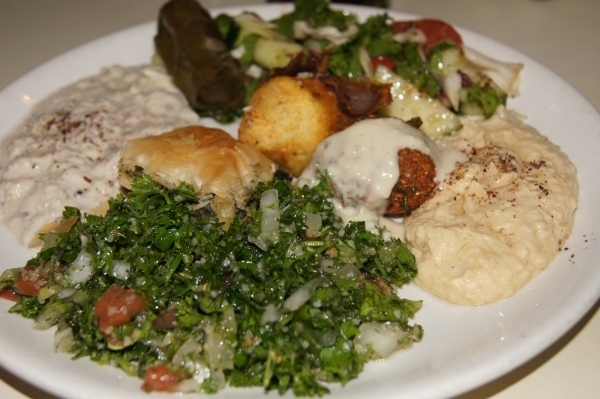 A Turkish restaurant on LaVista, Nicola’s makes anyone feel like family. Everyone is greeted by the owner upon entering and kept entertained by the length of the visit by him and one or all of the staff. If you’re lucky enough to visit on a Friday, Saturday or Sunday night you’ll be able to enjoy belly dancing. Be ready to be asked to join in. Everyone is and at some point in the night the entire restaurant is on their feet in the center of the dining room dancing to Middle Eastern pop tunes and sloppily belly dancing the best they can. I can only guess I might have better falafel and fried artichokes if I visited a Middle Eastern country and ate them locally. No, I take that back I’m sure these would beat anything I would get if I traveled thousands of miles. This is the absolute best Middle Eastern munchies I’ve ever had and the personal attention you get just adds to the experience. It’s peach season so we made sure to have enough room in the car on the trip home for extra cargo. If you’ve bought peaches locally you know they’re not cheap. They might seem cheap until you buy a sufficient quantity to do something with then you realize that $1.49 a pound adds up. Grocery stores and local farmers markets are not the place to buy peaches if you’re looking to save money. To do that you find the growers selling their product. Being able to haggle helps, as well. 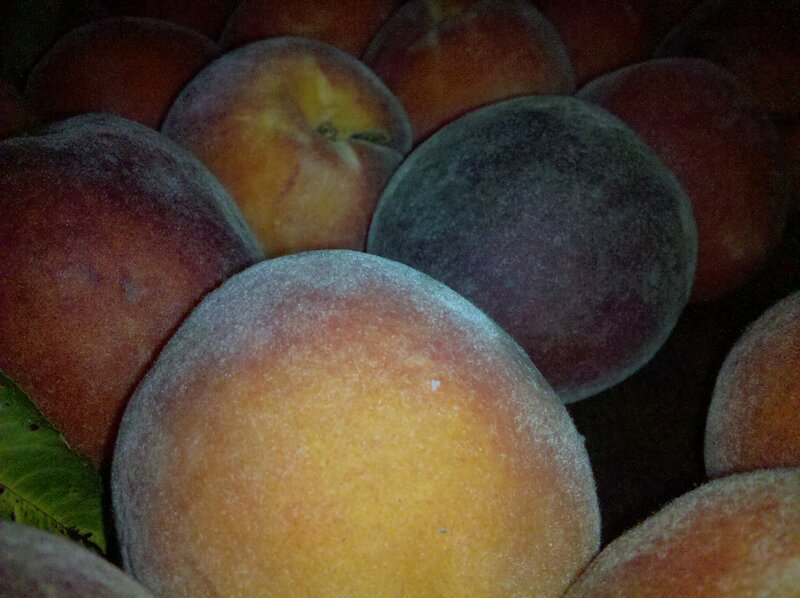 Instead of that $1.49 a pound we got 60 pounds of big, plump, sweet, juicy, delicious smelling peaches for $20. That comes out to about 33 cents a pound. That’s the way to buy peaches! Look soon for a post on various peach concoctions. I’m looking to try something peachy new. Any ideas? Our yearly trips to St. Augustine, Florida usually find us returning in tow with something new, whether it be tropical plants or fresh baked bread from The Spanish Bakery (yes, it’s worth bringing home). This year’s trip included a stop for fresh picked Georgia peaches. I bargained a great deal with the vendor at $10 a case. Though not my best price negotiation, which is $8 a case, I was happy with the outcome and picked up two cases. After loading my treasure into the car I realized there were only so many things I could make with peaches and seeing as I now had about 75 pounds of the delectable, fuzzy, sugar globes in my possession it was the time to start coming up with new recipes. We have just made peach barbecue sauce and, of course, peach ice cream. 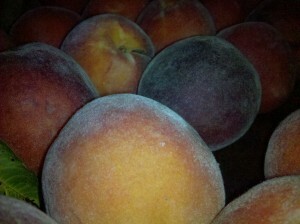 Peach cake, muffins, cupcakes are on the way and there will be plenty of peach cobbler to last weeks. There are sure to be some grilled peaches on a plate soon, as well. With all of those common ideas I am in search of something unusual. Maybe a peach ravioli with a nice peach marinara. If you have an idea or recipe for a peach delight drop it in the comments or email me. If it turns out well I’ll feature it here and give proper credit to you, of course. 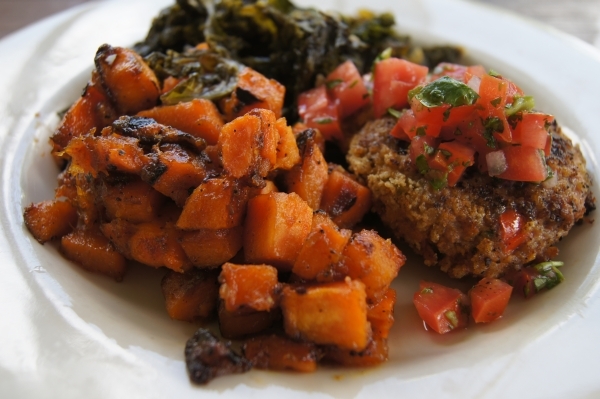 Nashveggie.com - Vegan & Vegetarian in Middle Tennessee.